In recent weeks, critics and even some Democratic allies have worried that Clinton has failed to satisfy some on the left. On Vox.com earlier this month, Ezra Klein wrote that “liberals walk away unnerved” after almost every interview Clinton had done around her recent book tour. “She bumbled through a discussion of gay marriage with [NPR’s] Terry Gross. She dodged questions about the Keystone XL pipeline. She’s had a lot of trouble discussing income inequality,” Klein asserted. Other progressives have expressed a desire to see a candidate rooted within the liberal wing of the Democratic Party, such as Sen. Elizabeth Warren (Mass. ), challenge Clinton. But poll numbers provide succor to Clinton supporters. A CNN poll conducted in late July showed that there was essentially no difference in the backing Clinton received from self-identified liberal Democrats over Democrats as a whole. Sixty-six percent of liberal Democrats supported her, as did 67 percent of all party supporters. Clinton allies object to the notion that the former secretary of State is in trouble with the left. “She is progressive and has support from the vast majority of progressives, which I would argue spans from the left to the middle, including some conservative Democrats along the way, too,” said one longtime aide. For all practical purposes this might as well be true, but it is an over-simplification. I certainly would not consider Clinton to be a liberal, but the right has moved to so such extremes that she could not be classified as a conservative today either. She may be a former Goldwater girl, but the Republicans have moved far to the right of Barry Goldwater. One significant factor is that while the Republican Party is pulled to the right by a strong conservative movement, the Democratic Party is a centrist party which often ignores liberal influence. Many liberals I discuss politics with are very concerned about Clinton’s relatively conservative views, but we also make up a tiny percentage of the centrist-dominated voters for the Democrats. Clinton also benefits from the widespread realization that there is not much choice other than to support her. The faction of the left which would vote for the Green Party or a Ralph Nader like challenge from the left is even smaller than those of us who feel Clinton is too conservative. Most of us anti-Clinton Democrats realize that whatever faults Clinton has, the Republicans will be as bad on foreign policy and far worse on domestic policy. Clinton also probably benefits from factors such as a favorable view among Democrats of electing the first female president. Plus there is nostalgia for the period of peace and prosperity when Bill Clinton was president. However the times have changed and electing a Clinton will not mean returning to the Clinton economy. I suspect that these factors also blind many Democratic voters to how conservative Clinton is on many issues, even if given warnings in recent interviews. She is likely to be seen as more socially liberal than she actually is do her position on “women’s issues” but being even Republican women are more liberal than the Republican establishment in this area. While Clinton has received criticism for appearing dishonest and calculating for naming the Bible as the book with the greatest influence on her thinking, that might not really be out of character considering her past participation with the religiously conservative Fellowship while in Congress. I also suspect that many liberals fail to realize how conservative she is on foreign policy issues. Being Obama’s Secretary of State blurs the distinctions between Clinton and the rest of the Obama administration, but during her tenure as Secretary of State the common pattern was for Clinton to push for a more hawkish position which was countered by others in the administration. 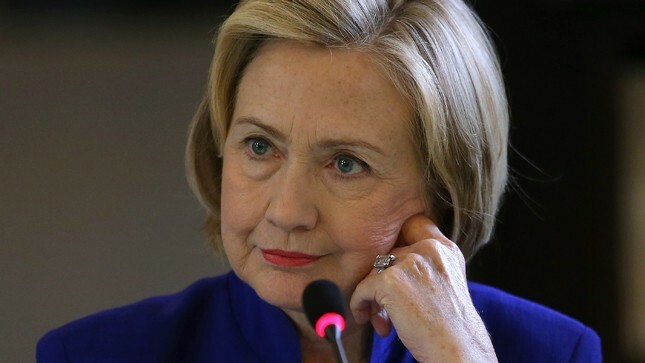 If someone were to mount a serious primary challenge to Clinton I suspect that opposition to Clinton would increase on the left, based upon foreign policy, economics, and social issues, along with questions about her competence and judgment. The 2008 race showed that deep down many Democrats do have reservations about Clinton and would support a viable challenge. Unfortunately, at least so far, I do not see such a challenge emerging. Many liberals who are concerned about Clinton’s Wall Street connections would love to see Elizabeth Warren run, but this is highly unlikely to happen. Bernie Sanders is talking about possibly running. Joe Biden is traveling to New Hampshire, leading to speculation about him running. While he is far from the ideal candidate, and I never really thought of backing him, as I read about how Biden was a strong voice against Clinton’s hawkish views in the Obama administration, Biden increasingly looks like a far more favorable alternative if he can mount a viable campaign and no better options arise.